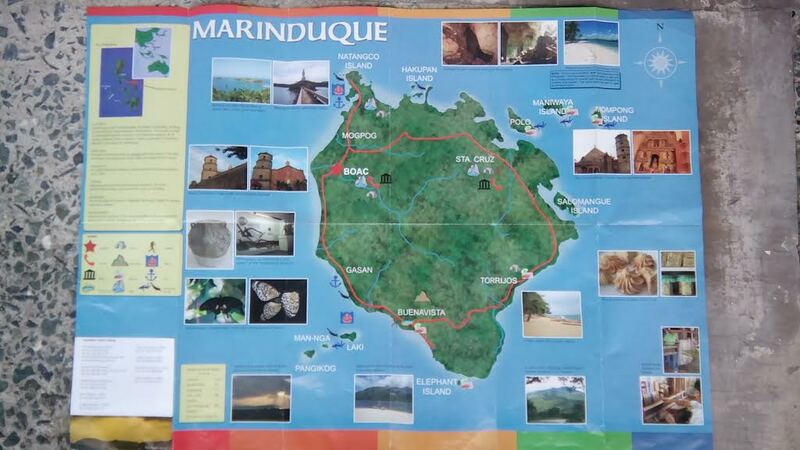 Marinduque is a province located in the middle of Bicol and Visayas Regions under the cluster called Mimaropa. Known for the Moriones Festival held every commemoration of the Holy Week, this is the place where Roman Catholicism is the utmost emblem and the remnants of Spanish colonization are still very evident up to the present days. There's no doubt that the best time to travel to Marinduque is during Semana Santa (Holy Week) season that happens in any dates from March to May because of the Moriones Festival. Of course since this is peak season, travelling to Marinduque from accommodation to flight to food is expensive. That's why I made a 3d2n travel guide to Marinduque's tourist spots that is ideal during off - season and summer getaways. This includes places to visit and where to stay in Marinduque. If you take a look at the Philippine map, Marinduque's shape is likened to a human heart floating on the blue ocean. Check it yourself! Boac is the capital municipality of Marinduque. It is also the place where the Spanish conquistadores and frailes lived. Start by saying a prayer at Boac Cathedral, constructed in 1760, it is one of the oldest churches in the country. See how enormous its interior especially the retablo or the grand altar in front, high walls and the imposing facade. Fresh and moving seafood is abundant in Boac's wet market. That thousand - worth of fairly - sized lobsters you bought in Manila, it costs less and much bigger in this province. Bring some native dishes whipped with coconut milk to munch whenever you want. Marinduque's arrowroot cookies and bibingka (rice cake) are two of the most popular delicacies you should never forget to taste. Marinduquenos' way of welcoming guests are quite different from other Philippine provinces. Instead of putting a a string of flowers around the neck, place it on top of the head like a crown." Visit Mompong Islet for the Ungab Rock Formation. If you love snorkeling and scuba diving, this is your paradise. If you came during low tide, get yourself a jump shot at Palad Sandbar and see if you can go to Polo Islet. The earlier time, the better. High tide occurs during late hours usually. 10 am Meet the women who weave placemats and wall decors using buntal fibers. 11 am Visit Lepidoptera farms, places where butterflies are bred. Most of them are found in the municipality of Gasan. Marinduque, unknown to many is the country's butterfly capital. Originated in the town of Mogpog, Moriones Festival is the reenactment of Christ's passion and death. The main character however is Longinus, the blind centurion who was able to see again miraculously that is why he converted to Christianity. 'Morion' means mask worn by Roman centurions like Longinus. Motioned refer to the men and women dressed in colorful Roman costumes. 3. Spray guns and paints are needed to color the mask with complete ornaments. Land via Quezon Province: From the Lucena Port, take a ferry either Balanacan or Buyabod. If you're looking for an affordable tour package, check out Dream Favor Travel and Tours. Email them dream favor travel and tours (at) yahoo dot com or check on Facebook.